The Museum of Decorative Arts in Prague has issued the book "Returns of Memory," mapping the history of Jewish items in its depositories that come from the property of Jews deported to concentration camps during WW2, museum director Helena Koenigsmarkova said at the book's presentation today. The museum has revived its collections in cooperation with other researchers and has identified a part of the Jewish items' original owners. Some of the works are part of the museum's permanent display. The project was prepared by the Documentation Centre of Property Transfers of Cultural Assets of WWII Victims and the Contemporary History Institute of the Czech Academy of Sciences. The centre, established in 2001, is trying to clarify historical and economic questions around the "Aryanisation," that is the expropriation of Jewish property on racial grounds in the Nazi era. 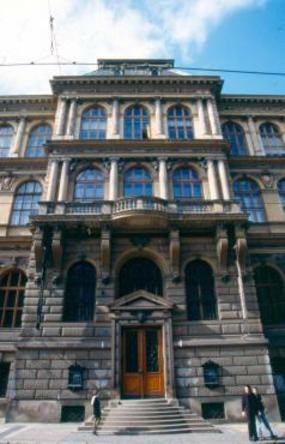 The centre also studies archive sources and depositories of museums and galleries. Last year, the government extended the centre's work until the end of 2011. Pavel Jirasek from the centre said the new book is important as it summarises a comprehensive research of one of the largest museums in the Czech Republic and it focuses on decorative art items the identification of which is more complicated than in the case of works of art that are usually registered more thoroughly. Helena Krejcova, one of the book's authors, noted that similar research is being carried out in the National Gallery and the National Museum plans it, too. Jirasek pointed out that the steps by Czech culture institutions and the Contemporary History Institute to redress property wrongs from the past set up trend that other countries have also adopted. Konigsmarkova, however, recalled that over 60 years after the war there are still a number of "unclear acquisitions" in Czech state museums that may originate from the confiscated Jewish property. Jirasek said Czech state institutions to date possess a lot of of artifacts that could be theoretically returned to the descendants of the Holocaust victims. The website, prepared by the Culture Ministry along with the Moravian Land Museum, registers almost 7,000 items from state collections in the Czech Republic that originate or may come from the property of the Holocaust victims and whose original owners were mostly killed by the Nazis. The Museum of Decorative Arts in Prague collects and preserves for future generations — in both national and international contexts — examples of historical and contemporary crafts, as well as applied arts and design. Prague is a beautiful place with some famous museums and historical structures. The museum of decorative arts is worth visiting. There are some great art works and other exhibits here.